I was tickled when the folks over at iVillage asked me to submit a holiday tablescape for their rockin’ site. When I checked the feature out this morning I saw that I was in very good company with bloggers like Mary from “Home Is Where the Boat Is” and Laura from “Our Prairie Home“. I was also introduced to a few bloggers with whom I was previously unfamiliar, so hooray! 😉 (If you’ve never visited iVillage, you might want to. It’s pretty awesome. SO much information about home & garden, great food, health & beauty…everything for women who want to be in the know!) Thank you, iVillage! The photo I submitted was of an unpublished Christmas tablescape, so since it’s out there now I figured I’d go ahead and give you the whole package. This is another tablescape created for my recent “Tablescaping a Winter Wonderland” class through MCC at Longview. 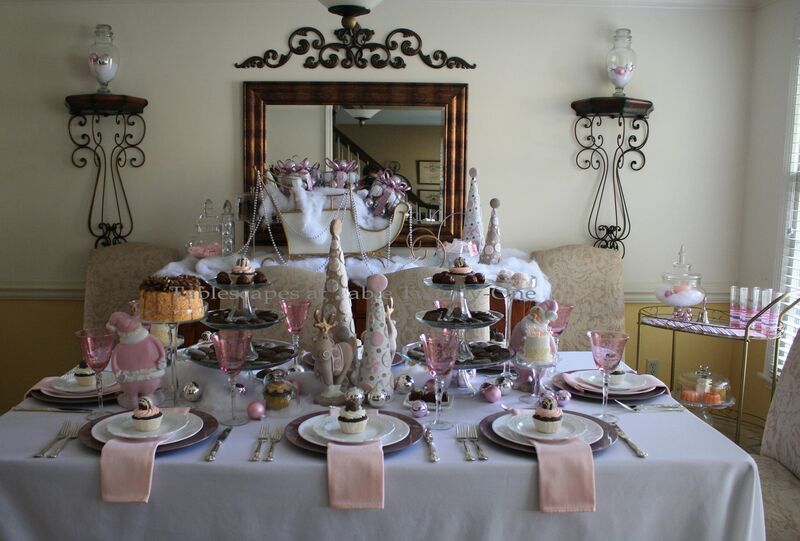 It would be a great table for a “tweener” or teen Christmas party for girls who still enjoy whimsy but feel more grown up when you add certain special touches. And as my friend Delia pointed out, this tablescape would also work really well for a winter baby shower! While pastel pink and purple are not “traditional” Christmas colors per se, they somehow work when visions of sugarplums, cookies and candies dance in your head. 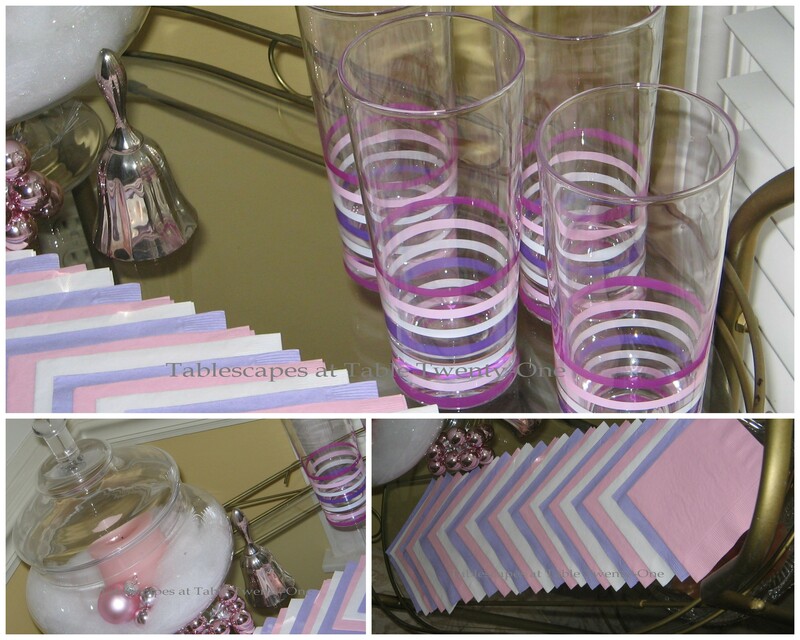 A snowy blanket of white linen covers the table from head to toe as a base for the bubblegum colors. 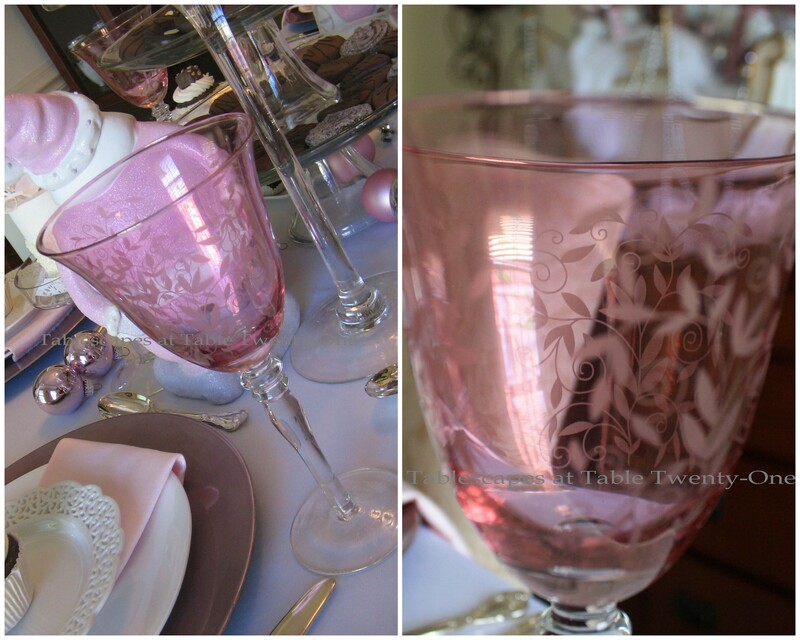 Delicately etched pink stemware is another grown-up touch. 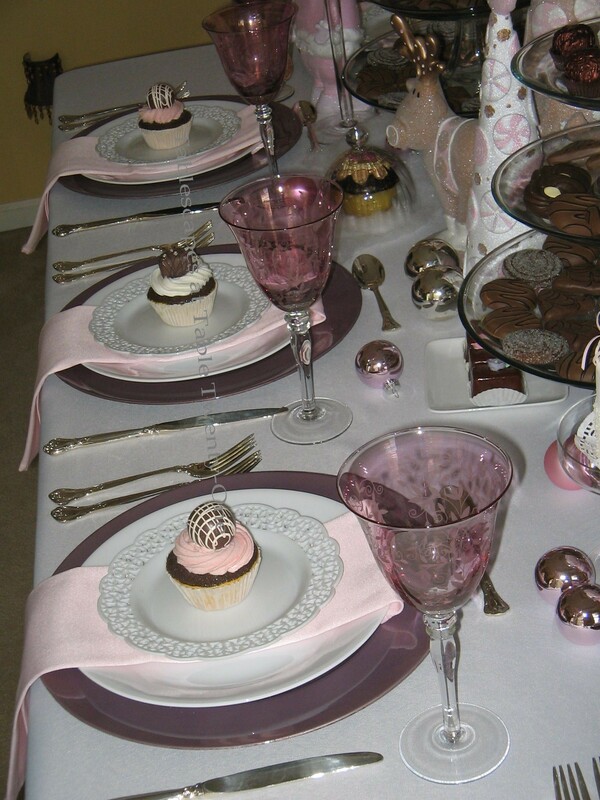 These “sugary” pink, purple, chocolate & white figurines picked up at 75% off at Burlington‘s end-of-season sale last year were the inspiration for the table. The sparkly finish on them makes them shimmer in the light. I am a forever fan of using food to help fill in a centerpiece. Not only does it look and smell great, but it adds color, texture and shape. Because everything is edible, that’s money saved! (Some of the food presented here is faux for class purposes.) I like to present food at varied levels on assorted trays, plates and bowls, and you simply can’t go wrong with glass stands! 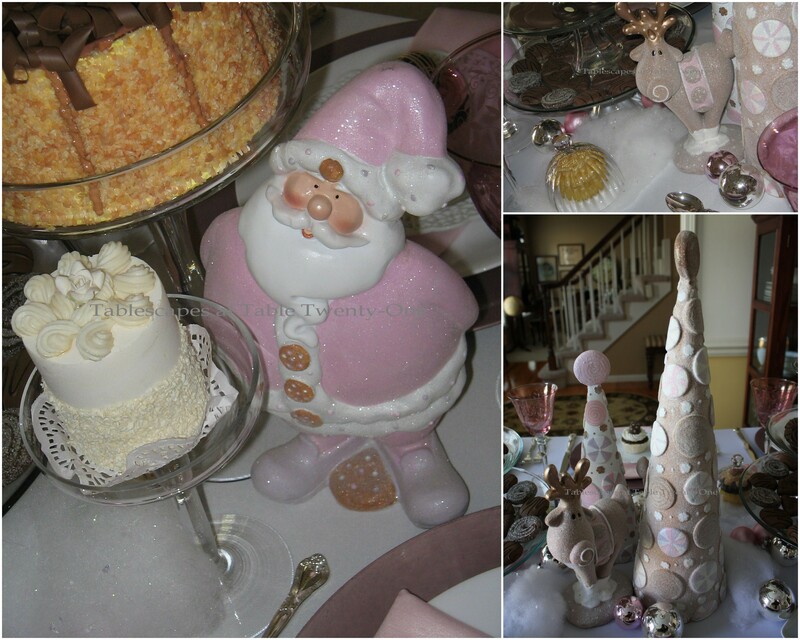 A little more color and shine is brought down to the base level of the table with pastel pink and silver ornaments. 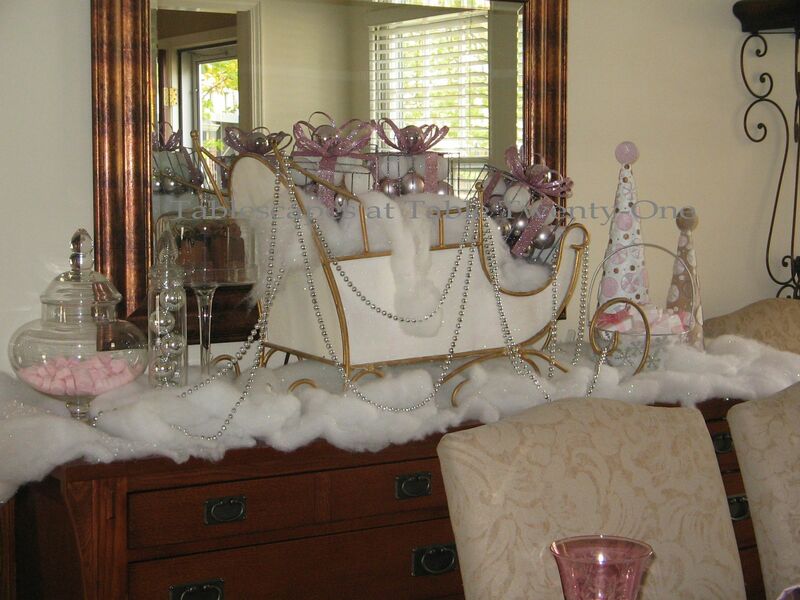 The buffet behind the dining table wholly subscribes to my philosophy of “Go big, or go home.” An oversized sleigh draped in silver bead garland (also used HERE) rests on a bed of cottony snow, filled with shimmering gifts in the prevailing colors of pink, purple and silver. 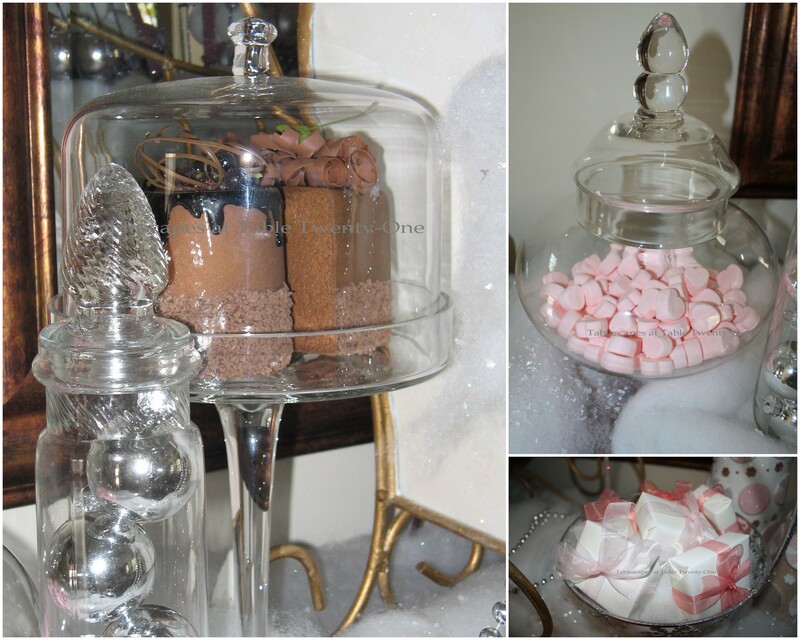 More sweets and ornaments are displayed in glass stands and jars. Additional tree figurines stand guard over a shimmering silver basket of neatly wrapped gifts. The tea cart stands ready to serve more beverages in these cute glass tumblers striped in pink, purple & white found at TJ Maxx for just $1 each on clearance. Paper napkins in the same colors are laid out for dessert. 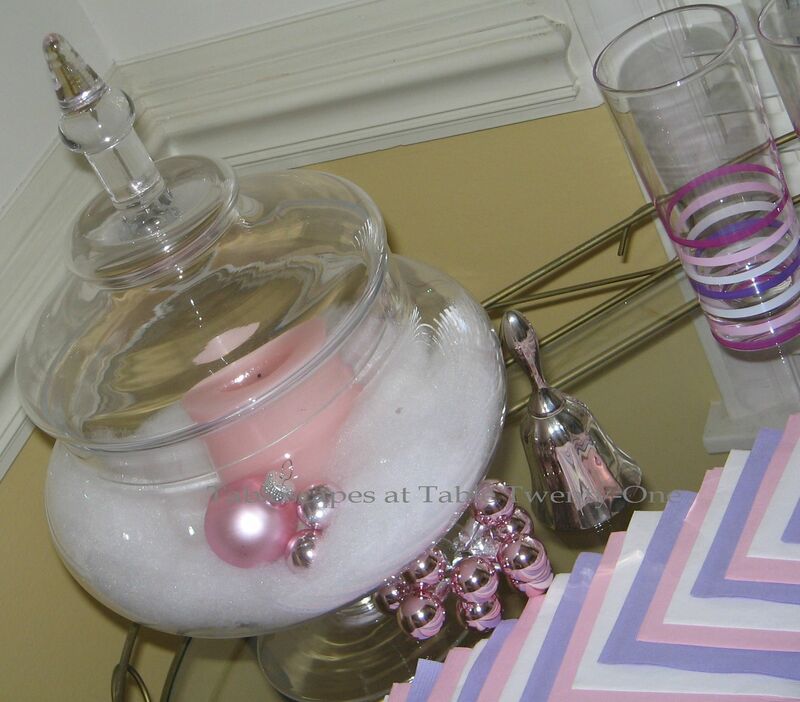 A glass apothecary jar holds a pouf of “snow” topped with a pale pink LED candle and a few random ornaments. More apothecary jars filled with snow, ornaments, and LED candles sit atop the china cabinet. check out NINE other posts all on the “Winter” page! Join me if you will this week at Susan’s place for “Tablescape Thursday” anytime after 9:00 a.m. CST and at the Style Sisters’ place for Centerpiece Wednesday. 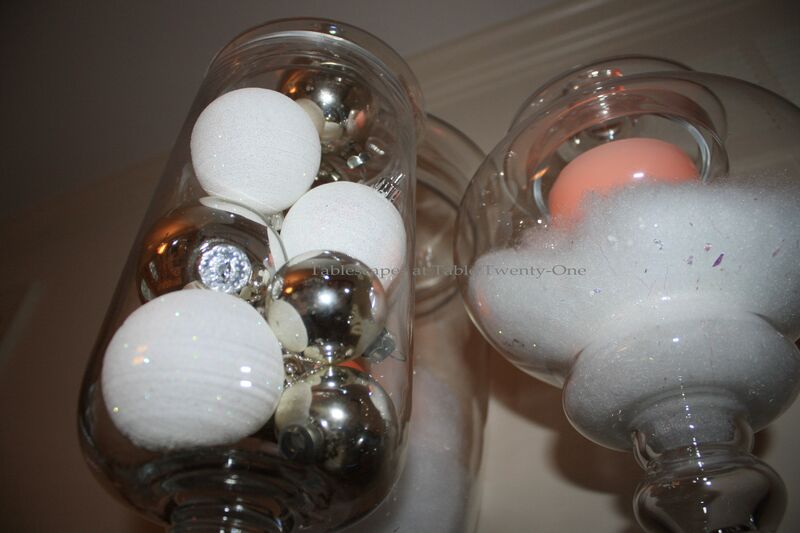 There are a lot of bloggers out there with terrific ideas for the holidays! Very soft. I like ! I love this, especially the Pink Santa, but alas I am not a tweener so I guess I can’t attend! ;>)) I am saving this post for future reference, BTW. The stemware is soooo gorgeous, and I have looked forever for some pretty pink ones. I first found out about blogging through iVillage when I read a newspaper article about a local woman who blogged. An attorney, she had a bunch of kids, a potty mouth, and the blog was incredibly popular! Through iVillage I also found other blogs, including the popular “A Beach Cottage” — and I was off to the races. When I read pink & purple chocolate it just sounded yummy and looks yummy also. Who would have thought Santa in pink, go girl. I like! 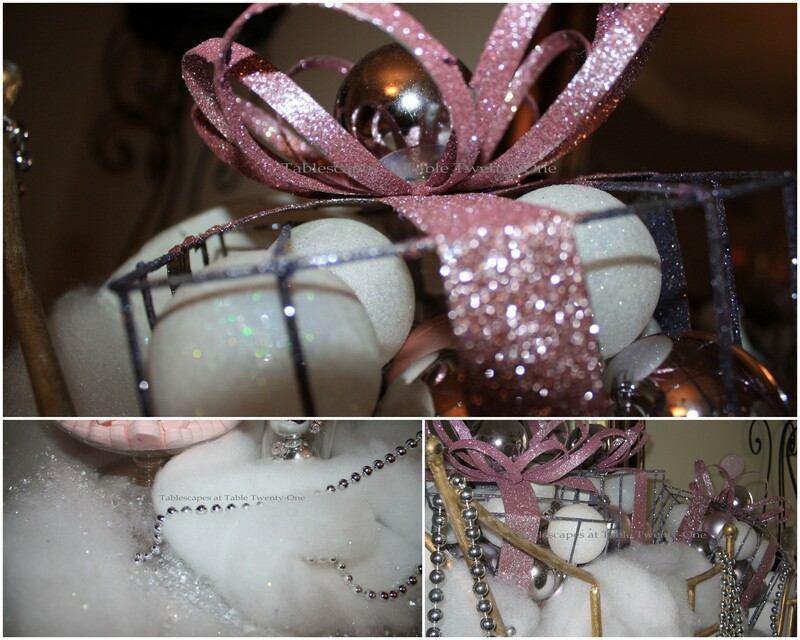 Alycia~ This is the perfect Visions of Sugar Plums table! The lavender chargers and etched pink stems are beautifully paired. This would be wonderful for a tween with a December birthday or for big girls 🙂 after an afternoon of Christmas shopping, needing sustenance! Of course a “go big or go home” pink cocktail would be required to match your wonderful sleigh! Congratulations on your iVillage feature! Lovely Alycia. I love the colors…not traditional, but so feminine. the Holidays are celebrated in so many colors these days. your stemware is OOH La La! 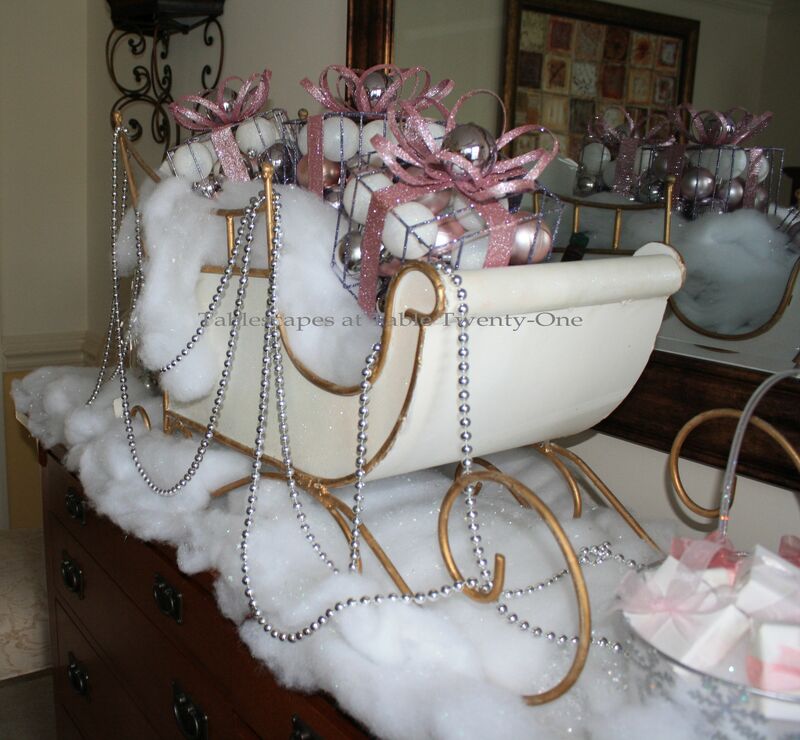 I want them….LOL Love that sleigh too. I will take the whole lot….Looks like fairytale land…..I want to sit there and eat all of those goodies too…Love it! Wow what fun you had with this one! The color choices are great! Love the sleigh on the buffet! So fun! I need to use mine for something interesting. I like the beads draped around on it and the cute little metal gift baskets! We need the Sugar Plum Fairy! I like your use of the different containers for food items and your table settings are very pretty! Any tween would adore this! That’s great. It’s fun to use pastels for Christmas for a nice change and anything with added chocolate is better!! Shut the front door!!! This is soooo cute and so Alycia. Did you do the baking? Oh goodness, I just love this. The minute you mentioned sugar plums, I could see the whole table unfold in front of me. I loved the color choices, and the tiered chocolates. I can totally see this as an after the Nutcracker celebration table. The stemware was beautiful, but I also love the tumblers. They add just the perfect touch of whimsy. And that sleigh is wonderful! And congrats on being featured on I village. I think they made a perfect choice, Mary (Home is where the boat is) is another favorite of mine. That table looks heavenly! The colors are soft and the chocolate looks devine. 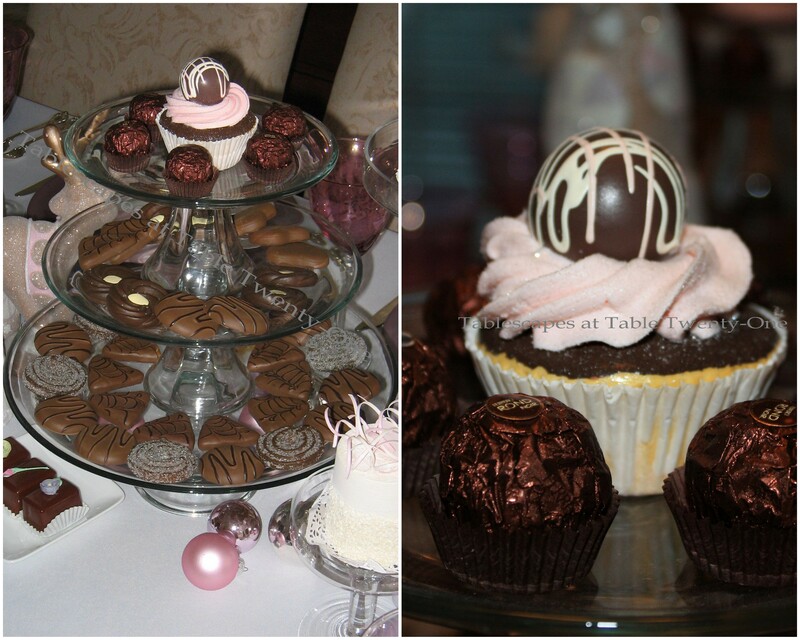 Chocolate lovers everywhere would like to be invited to this table, me included! Also that sleigh is stunning. Marvelous decorating once again! Candy Land!! Such lovely soft pastel elegance. Love the pink Santa! He’s just adorable. Well done Alycia. I think the cotton is my favorite part of this delicious scene! 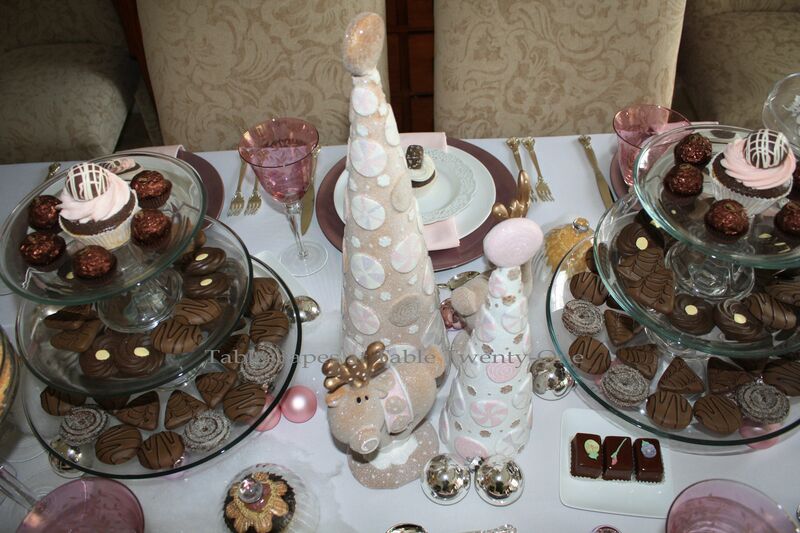 Love the pale pink & chocolate palette too! And the gifts are too clever! With your eye for detail and the personality that always shows through in your work, in good company is exactly where you should be. Oh, Alycia, this is fabulous! Any guest would be thrilled to see such a glorious table! (Well, maybe not a group of just–in-from-deer-hunting men, but anyone else!) This is definitely a table for inviting visions of sugarplums on Christmas Eve! You had me at “Pink & Purple Chocolate” Alycia! Love it all!! Oh my gosh Alycia your table and details are stunning!! 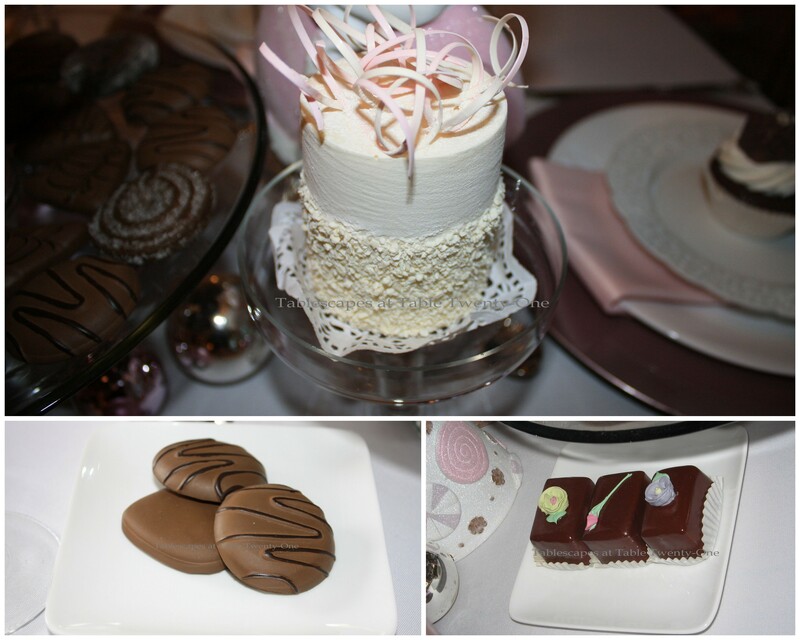 I’m doing a Sweet Shoppe Theme at my house this year and I love the pale pinks and of course chocolate. (smile) There is the cutest boutique in our area (shes been featured in Romantic Homes a couple of years ago) that has her little ‘bakery’ and bistro in the back of the store all done up in the pink and chocolate. I love to go there. And now it will remind me of your beautiful tablescape. 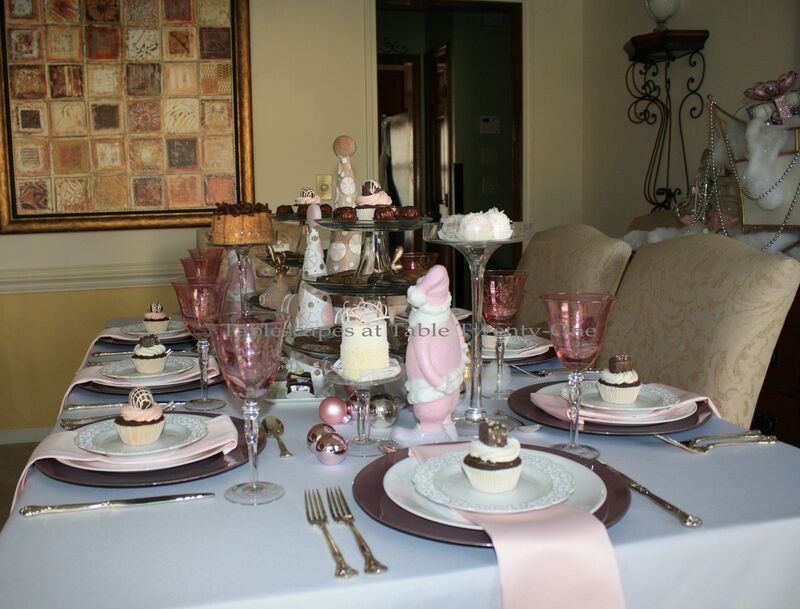 Come to think of it I have never seen a table done in the pink and chocolate. Its just over the top Fabulous. You get an A+ girlfriend for this one!! Wow, Alycia–what an amazing tablescape this is! 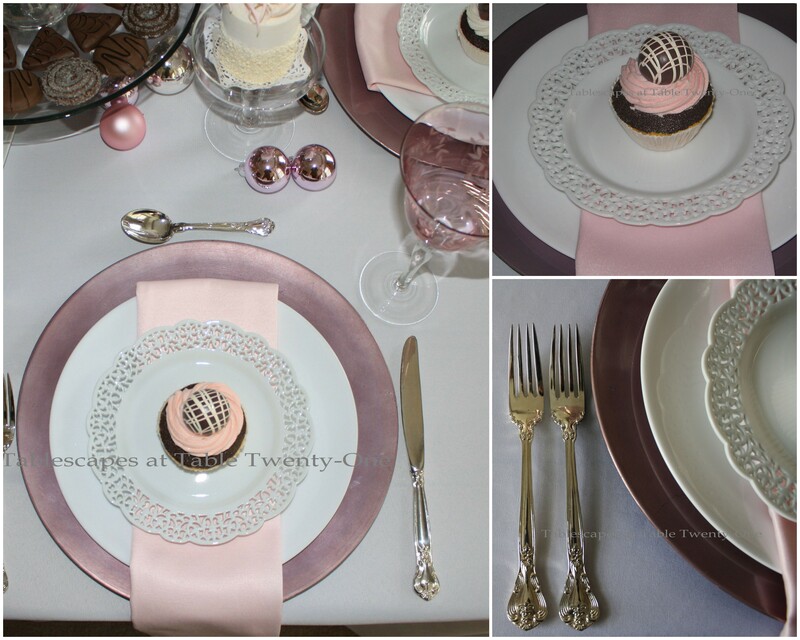 I love the pink stemware, and the gorgeous silver and the pretty white lacy plates. I watched the video as well–it was fun to see it all live! I can imagine The Nutcracker Suite playing in the background as the young ladies come in for a magnificent party 🙂 I am so glad you liked my earring organizer, and I do hope your friend finds the ideas useful. And You do not have a Charlie Brown head 🙂 My face is so square that I need long earrings to help lengthen it. I need as much length as I can get, all over my body! It looks like a beautiful Christmas fairyland and getting me in the Christmas mood already! I love pink any time of the year. You are never GOING HOME Alycia, you always do it up SO BIG! I adore this table and I am already listening to Christmas music. What better thing to be thankful for?!! The colors of this are so soft and pretty. Of course I am going to fall in love with purple and chocolate being featured! Delicious. Wow, wow, and WOW!!! This is amazing! I would never have thought of pink and purple for the Christmas holidays, but as I looked through these pictures, it occurred to me that this could be in the Sugar Plum Fairy scene of The Nutcracker Ballet. It truly could; that’s exactly what it makes me think of, especially with the sleigh on your sideboard. I just love this Alycia! 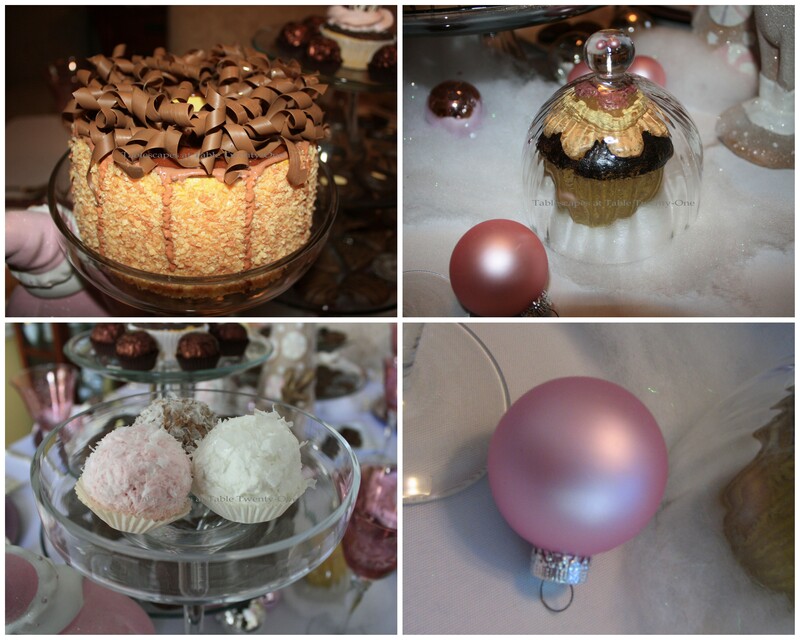 🙂 I love the little wrapped gifts in the bowl next to the sleigh, I love all the layers of chocolates and other confections, I LOVE those white doily plates from Pier 1, the pale pink napkins, and the pink and purple Christmas ornaments. This is all such a magical creation; your students must really enjoy your tablescaping classes. I was so glad to get a visit from you; thanks so much for your sweet comments on our fireplace!! It was great to hear from you. I agree that autumn is a beautiful and most colorful month. Congrats on being featured on iVillage, Alycia, and have a wonderful week! So unexpected and gorgeous! I think your table is a “vision of sugerplums”. Love the colors and the chocolate! Sugar plum fairy gorgeous! Well done… again! What a sweet table!! I love the soft muted colors. Pink and browns are one of my favorite combinations, and you have taken it to a new level. Beautiful! I am loving on your gadgets. They are beautiful in their forms and all those small details. All in all— Absolutely gorgeous. Everything is well choosen in this great setting for a great get together. Santa in pink? That’s even more gorgeous. Hmmm… you give an eye view of how my Christmas look like, Missy? I was thinking of black, white and red but pink? Outstanding. Thank you once again in every setting you show (at least to me) that always give me a motivation and the ideas. Hope you never stop sharing your never ending ideas. When is pink not appropriate…NEVER! So beautiful…and dare I say…girly??? And the goodies look delicious! Visions of sugar plums are dancing in my head! Your table and buffet are beautiful! I love the etched stemware and that awesome sleigh! I’ll bet you spent a fortune on all those goodies to eat. You are some kind of super woman, I declare! oh my goodness, this is amazing! and what an interesting color combo for xmas, i like it! I want to do something like this!! This is so beautiful!!! You are the master!! !